A band credited with helping to bring the sounds of country, most notably bluegrass, to urban dwellings, The Greenbriar Boys formed in 1958 during the now famous Sunday jam sessions at Washington Square Park in NY (spawning Joan Baez), and disbanded in 1967. In under a decade, the band recorded four records, three for Vanguard and one for Elektra. Those records have spawned three "best of" collections. 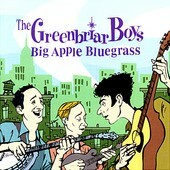 The newest, Big Apple Bluegrass, finds all the songs that didn't make 1986's The Best of the Greenbriar Boys (Vanguard) or last year's Best of the Vanguard Years. Including cuts off of their self-titled '62 debut, '64's Ragged But Right!, and their final record, Better Late Than Never, The Greenbriar Boys deliver hot, harmonious bluegrass. From the fast-picked banjo to the vocal harmonies, the band, even when going beyond bluegrass into traditional folk and then-contemporary country, makes things danceable and easy to sing along with. Here is yet another testament to their landmark sound. I'll give it an A-.